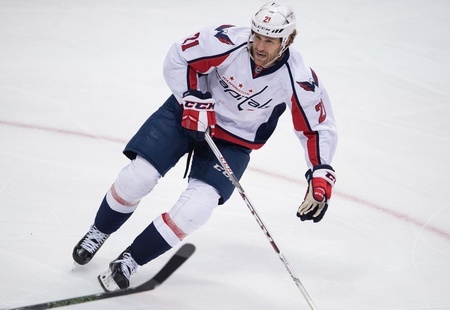 The Washington Capitals have traded Brooks Laich, Connor Carrick and a second round pick for the 2016 NHL Entry Draft to the Toronto Maple Leafs for Daniel Winnik and a fifth round pick for the 2016 NHL Entry Draft. This is the latest step in a makeover for the Maple Leafs, which has thus far seen the likes of Dion Phaneuf and goalie James Reimer move out of town. It also marks the end of an era for the Capitals, as Laich was a well-liked player and a great presence in the locker room. The trouble was that his contract was creating behind-the-scenes problems, with Washington running up against it in terms of potential future moves. In 59 games this season, Laich has just six points. The Capitals put him on waivers on Saturday, which certainly epitomized their intentions with the 32-year-old from Wawota. He has a year to go on his contract and is worth a cap hit of $4.5 million. Washington was right up against the cap ceiling and they acquired defenceman Mike Weber from Buffalo on Tuesday, so things are a little tight right now. Moving Laich gives them a hair’s worth of wiggle room and there was no money retained in this deal. In Winnik, the Capitals receive a 30-year-old Toronto native with the ability to play any forward position without losing an ounce of defensive credibility. He’s a good-sized player, too, and can muck it up. But his offensive upside is limited and he hasn’t scored a point in the last six games. He signed a two-year deal worth $4.5 million last season. What’s more, this marks the second straight year the Maple Leafs have traded Winnik before the deadline. He was traded to the Penguins last February for Zach Sill and a few picks, but he was largely ineffective in terms of guiding Pittsburgh to a deep post-season run. He signed with the Leafs again on July 1 of 2015 and saw time as a penalty killer.